For your holiday viewing pleasure, I submit the following hilarity from the pen of crowdaughter . I think she caught the likeness of a certain Elvenking very well! Galion says they are what the Mortals call 'action figures,' but I see it as a Noldorin plot to warp the child's sexuality! Why, who knows which among that Fellowship he may end up fancying? Galion just said something about 'Bill the Pony.' Galion has been sent to clean the garderobe. 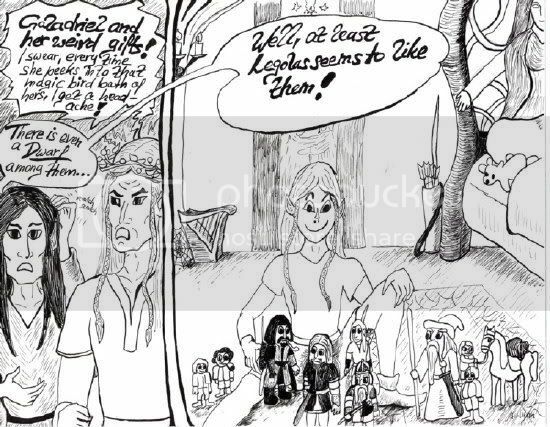 (Tongue firmly in cheek, looking innocent): But I thought the Elves *liked* their horses? On another note: may I post this on my own lj, too? I am thinking of doing a 'holiday cartoon series'. Greetings to You and Cheers! And a merry Yule to you! *bows* I will do so, then! And to you! May you have a wonderful celebration!